Our Shipping Solutions Professional export software allows you to quickly and easily prepare the IATA and IMO Dangerous Goods forms and print them out on plain paper. You can download a free copy of the IATA Shipper's Declaration of Dangerous Goods for air shipments and the IMDG-Code Shipper’s Declaration of Dangerous Goods form for non-air shipments from our website in PDF format. The International Air Transport Association which makes up the majority of the world`s airlines, uses the ICAO Technical Instructions for the Safe Transport of Dangerous Goods by Air as the basis for their dangerous goods regulations (IATA-DGR). Some airlines have specific operational variations. These variations identify unique requirements specific to that particular airline and are always more restrictive than the DGR. FedEx, for example, has very specific documentation requirements and shippers should be aware of these variations. 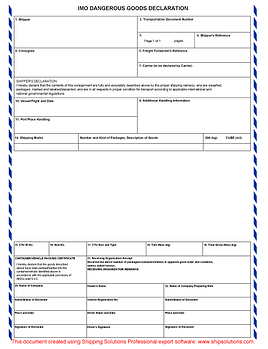 Air Waybill(s) accompanying dangerous goods consignment(s) for which a dangerous goods declaration is required must include the following statements, as applicable, in the Handling Information box: “Dangerous goods as per attached Shipper's Declaration” and possibly “Cargo Aircraft Only” if applicable. Shipping dangerous goods internationally by vessel is regulated through the International Maritime Organization (IMO). The IMO is a specialized agency of the United Nations. The IMO uses the International Maritime Dangerous Goods Regulations Code (IMDG Code) as the basis for international enforcement of dangerous goods transportation by vessel. These regulations are amended every two years with each amendment valid for three years. 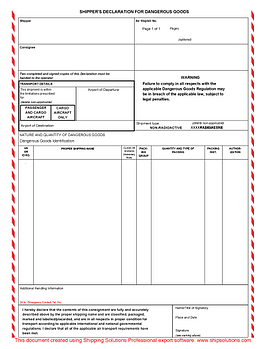 The IMDG Code requires a declaration from the consignor stating that the particular dangerous goods declared are identified, classified, packaged, marked, labeled and placarded correctly. A declaration from the person packing the container is also required to ensure it has been done so correctly. The DG declaration and Container Packing Certificate can be in any format, but must be in accordance with Chapter 5.4 of the IMDG-Code. 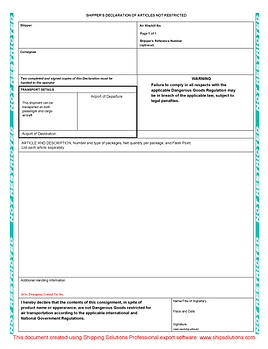 Although not mandatory, this form relieves any suspicion if handlers question the nature of the product and assures them there are no dangerous goods involved. It also shows the shipper has taken due diligence and responsibility, formally presenting the product information and stating the article, or material, being shipped is not restricted for air transport.